1. United States 18 6 0 0 66: 27 1. 2. Australia 15 5 0 1 56: 35 4. 3. Netherlands 10 3 0+1 2 48: 42 12. 4. China 6 2 0 4 34: 49 2. 5. Canada 8 2 1+0 3 44: 54 8. 6. Russia 5 1 1+0 4 54: 65 6. 7. Italy 10 3 0+1 2 59: 45 7. 8. Brazil 0 0 0 6 32: 76 14. Italy, Russia and Netherlands from Women Europe 2015. United States, Australia, Canada and Brazil more from Women Intercontinental 2015. Best not qualified teams: Spina (3. ), Hungary (5. ), Great Britain (9. ), Greece (10.). USA found the gates very fast by soaring three goals 3-0 within four minutes and finishing 6-2 in the first quarter. Australia fought back in the second quarter, earning 3 points while the USA 1. Both teams became more defensive in the third quarter which saw a 0-0 blank. Nicola Zagame 's last minute shot gave Australia 8-7 narrow loss. Ashleigh Southern of Australia was the only player who scored 3 goals in the final. United States: Hill Samantha, Musselman Madeline, Seidermann Melissa, Fattal Rachel, Clark Caroline (1), Steffens Margaret (Captain, 1), Mathewson Courtney (2), Neushul Kiley, Grossman Ashley, Gilchrist Kaleigh (2), Fischer Makenzie (1), Craig Kameryn (1), Johnson Ashleigh. Head Coach: Adam Krikorian. Australia: Yanitsas Lea, Barr Chloe, Buckling Hannah, Lincoln-Smith Holly, Bishop Isobel, Knox Bronwen (Captain), Gofers Keesja, McGhie Glencora, Arancini Zoe, Southern Ashleigh (3), Halligan Bronte (2), Zagame Nicola (2), Wakefield Kelsey. Head Coach: Greg McFadden. Game 5th-6th: Russia 16 - Canada 8 / Quarters: 2-1, 4-4, 7-1, 3-2. Game 7th-8th: Italy 11 - Brazil 2 / Quarters: 0-0, 3-0, 2-1, 6-1. Italy: Gorlero Giulia, Tabani Chiara (2), Garibotti Arianna (3), Radicchi Federica (2), Queirolo Elisa (2), Aiello Rosaria, Di Mario Tania (Captain), Bianconi Roberta , Emmolo Giulia, Pomeri Francesca (1), Cotti Aleksandra, Frassinetti Teresa, Teani Laura. Head Coach: Fabio Conti. Game 19: Netherlands 5 - United States 8 / Quarters: 1-2, 1-3, 0-3, 3-0. United States: Hill Samantha, Musselman Madeline, Seidermann Melissa, Fattal Rachel (1), Clark Caroline, Steffens Margaret (Captain), Mathewson Courtney, Neushul Kiley , Grossman Ashley (2), Gilchrist Kaleigh (1), Fischer Makenzie (2), Craig Kameryn (2), Johnson Ashleigh. Head Coach: Adam Krikorian. 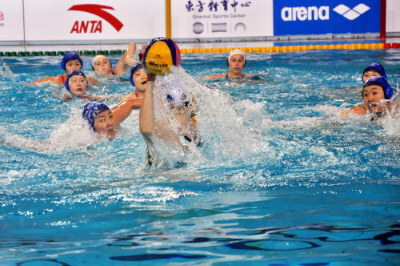 Game 20: China 3 - Australia 5 / Quarters: 1-3, 0-1, 1-1, 1-0. Australia: Yanitsas Lea, Barr Chloe (1), Buckling Hannah, Lincoln-Smith Holly, Bishop Isobel, Knox Bronwen (Captain, 2), Gofers Keesja, McGhie Glencora, Arancini Zoe, Southern Ashleigh (1), Halligan Bronte, Zagame Nicola (1), Wakefield Kelsey. Head Coach: Greg McFadden. Italy: Gorlero Giulia, Tabani Chiara (1), Garibotti Arianna (1), Radicchi Federica, Queirolo Elisa, Aiello Rosaria (1), Di Mario Tania (Captain, 2), Bianconi Roberta (4), Emmolo Giulia (1), Pomeri Francesca, Cotti Aleksandra (1), Frassinetti Teresa, Teani Laura. Head Coach: Fabio Conti. Game 13: Italy 7 - Netherlands 8 Quarters: 2-3, 2-3, 1-1, 2-1. Italy: Gorlero Giulia, Tabani Chiara (2), Garibotti Arianna (1), Radicchi Federica (1), Queirolo Elisa, Aiello Rosaria (1), Di Mario Tania (Captain), Bianconi Roberta (1), Emmolo Giulia, Pomeri Francesca (1), Cotti Aleksandra, Frassinetti Teresa, Teani Laura. Head Coach: Fabio Conti. Game 14: China 6 - Canada 5 Quarters: 2-0, 1-2, 2-2, 1-1. Australia: Yanitsas Lea, Barr Chloe (1), Buckling Hannah, Lincoln-Smith Holly, Bishop Isobel (1), Knox Bronwen (Captain 3), Gofers Keesja (1), McGhie Glencora (3), Arancini Zoe (1), Southern Ashleigh (3), Halligan Bronte (2), Zagame Nicola (2), Wakefield Kelsey. Head Coach: Greg McFadden. Game 16: Russia 6 - United States 17 Quarters: 0-4, 0-4, 3-5, 3-4. United States: Hill Samantha, Musselman Madeline (1), Seidermann Melissa, Fattal Rachel (4), Clark Caroline, Steffens Margaret (Captain, 2), Mathewson Courtney (1), Neushul Kiley (5), Grossman Ashley (2), Gilchrist Kaleigh, Fischer Makenzie (1), Craig Kameryn, Johnson Ashleigh. Head Coach: Adam Krikorian. Game 9: Netherlands 3 - United States 8 / Quarters: 1-2, 0-1, 1-2, 1-3. Game 10: Italy 7 - Australia 8 / Quarters: 3-2, 1-2, 2-2, 1-2. Italy: Gorlero Giulia, Tabani Chiara (1), Garibotti Arianna (3), Radicchi Federica, Queirolo Elisa, Aiello Rosaria, Di Mario Tania (Captain), Bianconi Roberta (2), Emmolo Giulia, Pomeri Francesca (1), Cotti Aleksandra, Frassinetti Teresa, Teani Laura. Head Coach: Fabio Conti. Australia: Yanitsas Lea, Barr Chloe (1), Buckling Hannah, Lincoln-Smith Holly, Bishop Isobel (3), Knox Bronwen (Captain, 1), Gofers Keesja, McGhie Glencora, Arancini Zoe, Southern Ashleigh (2), Halligan Bronte, Zagame Nicola (1), Wakefield Kelsey. Head Coach: Greg McFadden. Game 11: Canada 11 - Brazil 8 / Quarters: 5-1, 4-3, 2-2, 0-2. Game 12: China 9 - Russia 7 /Quarters: 3-1, 1-2, 3-3, 2-1. Australia: Yanitsas Lea, Barr Chloe, Bucking Hannah (2), Lincoln-Smith Holly, Bishop Isobel (1), Knox Bronwen (Captain, 1), Gofers Keesja (1), McGhie Giencora, Arancini Zoe, Southern Ashleigh (1), Halligan Bronte (3), Zagame Nicola (2), Wakendfield Kelsey. Head Coach: Greg McFadden. China: Yang Jun, Tian Jianing, Mei Xiaohan, Xiong Dunhan, Niu Guannan (1), Sun Yating (Captain, 1), Song Donglun, Zhang Cong, Zhao Zihan (2), Zhang Weiwei, Wang Xinyan, Zhang Jing (1), Peng Lin. Head Coach Ricardo Azevedo. 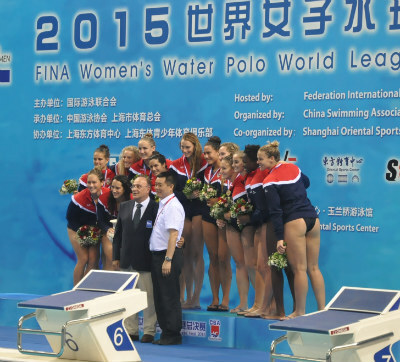 Netherlands: Aarts Laura, Smit Miloushka (Captain, 3), Genee Dagmar, Van der sloot Gatharina (2), Genee Amarens (1),Stomphorst Nomi, Nijhuis Marloes (1), Sevenicch Vivian (2), Megens Maud, Van toom Isabella (1), Klaassen Lieke (2), Van der molen Lenie (1), Willemsz Debby. Head Coach: Arno Havenga. Brazil: Oliveira Tess, Bahia Viviane, Zablith Marina (Captain, 1), Canetti Marina, Barroncas Lucianne, Chiappini Izabella (2), Oliveira Amanda (1), Carvalho Luiza, Dias Melanie, Fernandes Flavia, Coutinho Mirella, Mantellato Gabriela (1), Chamorro Victoria. Head Coach: Patrick Oaten. Game 7: Italy 14 - Russia 12 / Quarters: 5-3, 5-3, 4-1, 0-3. Italy: Goriero Giulia, Tabani Chiara, Garibotti Arianna (1), Radicchi Federica (1), Queirolo Elisa, Aiello Rosaria Aiello, Di Mario Tania (Captain, 2), Bianconi Roberta (2), Emmolo Giulia (3), Pomeri Francesca (1), Cotti Aleksandra, Frassinelti Teresa (4), Teani Laura. Head Coach, Fabio Conti. United States: Hill Samanstha, Madeline Musselman, Melissa Seidemann, Fattal Rachel (2), Clark Caroline (1), Steffens Margaret (Captain, 1), Mathewson Courtney (1), Neushul Kiley (2), Grossman Ashley, Gilchrist Kaleigh, Fischer Makenzie (2), Craig Kameryn, Johnson Ashleigh. Head Coach: Adam Krikorian. Canada: Gaudreault Jessica, Alogbo Krystina (Captain), Monton Katrina (1), Wright Emma, Eggens Monika (1), Mckee Kelly, Bekhazi Joelle (1), Fournier Shae, Eggens Carmen, Robinson Christine, Valin Stephanie, Perreault Dominique, Collerjohn Nicola. Head Coach: Johanne Begin. Netherlands: Aarts Laura, Smit Miloushka (Captain, 5), Genee Dagmar (1), Van der sloot Gatharina (1), Genee Amarens (1),Stomphorst Nomi (1), Nijhuis Marloes (2), Sevenicch Vivian, Megens Maud (2), Van toom Isabella, Klaassen Lieke (1), Van der molen Lenie, Willemsz Debby. Head Coach: Arno Havenga. Canada: Jessica Gaudreault, Krystina Alogbo, Katrina Monton, Emma Wright (2), Monika Eggens (3), Mckee Kelly, Joelle Bekhazi (4), Shae Fournier, Carmen Eggens, Christine Robinson (1), Stephanie Valin (5), Dominique Perrault, Claire Wright. Head Coach: Johanne Begin. Game 2: United States 16 - BRAZIL 3 / Quarters: 4-1, 5-0, 4-0, 3-2. United States: Hill Samanstha, Madeline Musselman (2), Melissa Seidemann (2), Fattal Rachel (1), Caroline Clark (1), Margaret Steffens (Captain, 2), Courtney Mathewson (2), Kiley Neushul (1), Ashley Grossman, Kaleigh Gilchrist (2), Makenzie Fischer (2), Kameryn Craig (1), Ashleigh Johnson. Head Coach: Adam Krikorian. Brazil: Tess Oliveira, Viviane Bahia, Marina Zablith, Marina Canetti (1), Lucianne Baroncass, Izabella Chiappini (1), Amanda Oliviera, Luiza Carvalho, Melanie Dias, Flavia Fernandes (1), Mirella Coutinho, Gabriela Mantellato, Victoria Chamorro. Head Coach: Patrick Oaten. Game 3: Australia 8 - RUSSIA 4 / Quarters: 3-3, 2-0, 1-0, 2-1. Australia: Lea Yanitsas, Chloe Barr, Hannah Buckling, Holly Lincoln-Smith, Isobel Bishop, Bronwen Knox (Captain, 1), Keesja Gofers (1), Giencora McGhie (2), Zoe Arancini, Ashleigh Southern, Bronte Halligan (1), Nicola Zagame (3), Kelsey Wakendfield. Head Coach: Greg McFadden. Italy: Giulia Goriero, Chiara Tabani, Arianna Garibotti (3), Federica Radicchi (1), Elisa Queirolo,, Rosaria Aiello (1), Tania Di Mario (Captain, 3), Roberta Bianconi, Giulia Emmolo, Francesca Pameri (2), Aleksandra Cotti (1), Teresa Frassinelti, Laura Teani. Head Coach, Fabio Conti. China: Yang Jun, Tian Jianing, Mei Xiaohan, Xiong Dunhan, Niu Guannan (2), Sun Yating (Captain, 2), Song Donglun, Zhang Cong, Zhao Zihan, Zhang Weiwei, Wang Xinyan, Zhang Jing, Peng Lin. Head Coach Ricardo Azevedo.